1. Avoid using any of the popular spray dusting helpers. These tend to leave a nasty buildup on furniture that’s hard to remove later on. Instead, use a soft cloth to gently wipe away the dust. You can also slightly dampen the cloth with liquid glass cleaner. 2. Avoid using any of the popular oil-based liquid furniture polishers. These leave an oily residue that attracts dust. Lemon oil is one of the worst because it doesn’t sink into the wood like commonly thought but lays on the surface acting as a dust magnet. 3. If there’s oily dirt or grease, such as may get on pieces in a kitchen, remove it with a mild dish detergent and water solution. Work on small areas at a time and dry immediately with a soft cloth. 4. Be extra careful when cleaning any wood that has been gilded. The gilt is usually applied with a water-soluble adhesive which can be removed by detergent cleaners. 5. To clean uneven or carved surfaces, use a soft-bristled brush or your vacuum cleaner with the brush attachment. Be careful not to hit the furniture in any way with the vacuum cleaner, itself. 6. Do not use feather dusters. They move the dust around and can scratch the surface. 7. Before using any cleaner on the surface of your furniture, test an inconspicuous area towards the back first. 8. Always avoid using too much liquid directly on your furniture’s surface. 9. You can get long-term protection by using a good paste wax, such as Minwax. This is a petroleum-based product that comes in both natural and dark shades for light and dark-stained furniture, respectively. The hard surface it produces can be dusted more easily and without the danger of scratching because its smoother. Waxing once or twice a year is sufficient for table tops and chair arms. For less used areas of furniture, such as chair legs and case pieces, wax only every four years. 10. Try not to polish hardware while it’s attached to the furniture. The polish will damage the furniture’s finish. Instead, remove the hardware and polish separately, being sure to rinse or wipe it thoroughly before reattaching it to your pieces. If you can’t remove the hardware from your piece, be sure to mask it from the furniture’s surface to prevent damage. For ornate hardware, use a cotton swab dipped in the detergent solution. 11. Do not polish ormolu, which really isn’t brass but bronze. Instead, wash it with a soft cloth soaked with a mild dish detergent. 12. To remove the musty odor from an antique cabinet or drawers of a chest, spray with Fabreeze and let dry. To keep it fresh, place a new drier sheet inside each cabinet or drawer. 13. If mold or mildew forms on a piece of antique furniture, dampen a soft cloth with a very mild bleach solution (two tablespoons of bleach to a quart of water) and wipe the affected area. Dry immediately with a soft cloth, then wax as stated above. 14. 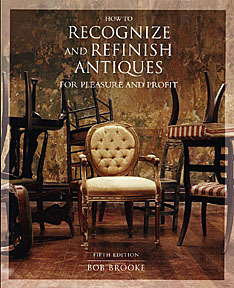 Heat dries out the wood of antique furniture, loosening joints. Keep your house at a comfortable level but not excessively hot in the winter. If you must keep the temperature up, put pans of water around to humidify the air or use a humidifier. The air will be healthier for you, too.